Last Christmas Delaney had the pleasure of meeting a delightful young lady named Melissa Middleton and her mother Angela through Delaney’s annual Christmas Adoption program. Melissa is intellectually challenged and her mother Angela was battling cancer for the second time. This precious family was facing some difficult months, so we decided to adopt them as our Christmas Family last year. As we prepared to deliver Christmas gifts to our new friends, we had no idea that we were meeting a future Para Pan American Athlete. 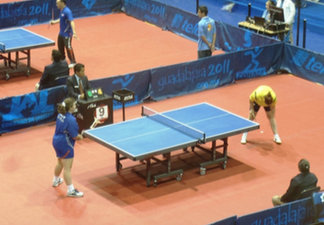 Melissa (blue) during a match at the 2011 Parapan Am Games in Guadalajara, Mexico. The Parapan American Games is a multi-sport event held every four years for athletes with physical disabilities. Me- lissa was the first American on the Division 11 Team, which is specifically for athletes with an intellectual disorder rather than a physical disability. This past summer Melissa qualified to compete in the 2011 Table Tennis Games that were held in Guadalajara, Mexico last month. Neither mother nor daughter had ever been on a plane be- fore they were whisked off to Colorado Springs for a week of training at the Olympic Training Center. They were then flown to Guadalajara, Mexico where Melissa completed the remainder of the training and then competed in the 2011 games. She placed 3rd for her division. During the experience Melissa became the team “mascot” if you will, and anyone who knows her understands why. Her bright eyes and big smile light up any room, but that is only topped by her contagious giggle that brings out the kid in all who are around her. She will continue to train for Table Tennis around her many other sports which include bowling, baseball, hockey, cheerleading, and dance. But she insists that Table Tennis is her favorite. We put her to the test and invited her to play against our resident champi- on Tehvid Dedic here at our Delaney warehouse. It was a tough match, but Melissa came out on top. Tehvid has asked Melissa for a rematch very soon, and of course she accepted.